The term ‘sin’ is portrayed using a variety of terms. The biblical writers describe sin as that condition and activity of human beings that is offensive to God. Sin is revolt against holiness and sovereign will of God. It is both a condition of the heart, mind, will, affections and the practical outworking of that condition in thoughts, words, and deeds that offend God and transgress His holy law. In secular terms, sin means any offense against good morals, any offense against established law of the Land, and any violation of standard code for human behavior and action. WHOLE DUDE – WHOLE SIN : Sin is that condition of the heart, mind, will, affections and the practical outworking of that condition in thoughts, words, and deeds that offend this Declaration of Independence and sin is any action that transgress the intent of this Declaration of Independence upon which the nation called the United States of America is created. The Declaration of Independence adopted July 04, 1776 to pronounce the creation of the United States spells in very clear, and transparent terms the American ideal of Government based on the Theory of Natural Rights. This Declaration states the philosophy of Human Freedom and the Nation and its Government is formed by Social Contract. United States and its elected officials who represent the entity called Government have to adhere to these founding principles and they must be guided by the Laws of Nature which guarantee unalienable rights of man. Governments are instituted among men to secure their unalienable rights and Governments derive their just powers from the consent of the governed. And for the support of this Human Freedom, we must mutually pledge to each other our Lives, our Fortunes, and our sacred Honor. In this context, I would like to define the term “WHOLE SIN” as a condition of the heart, mind, will, affections and the practical outworking of that condition in thoughts, words, and deeds that offend the Declaration of Independence and transgress the Laws of Nature. Memorial is anything that serves to help people to remember some person or event. 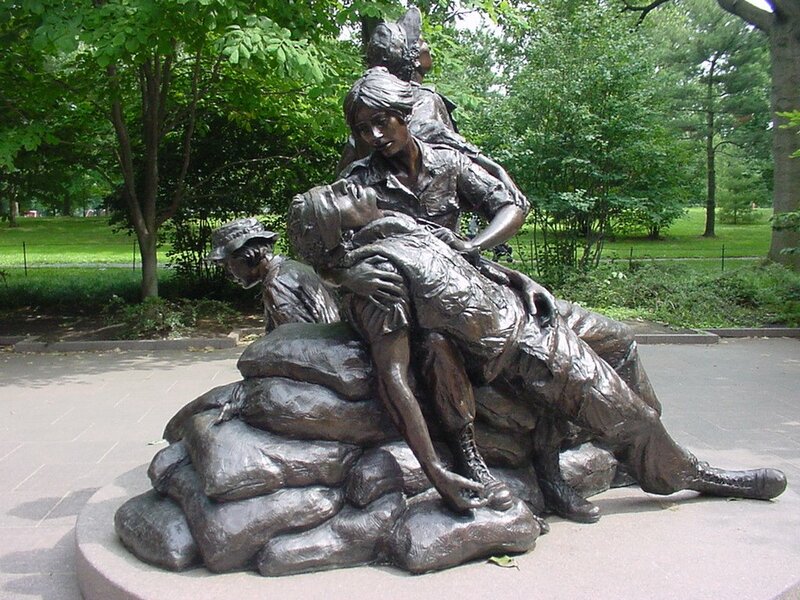 I would like to share the photo images of the Vietnam Veterans War Memorials to remind people that we fought these wars to contain the threat posed by Communism to the doctrine of Human Freedom, and the Rule of Governance called Democracy. Whole Dude – Whole Sin : Remember the Vietnam War. America called its sons and daughters to pledge their Lives, their Fortunes and their sacred Honor to fight the Enemy called Communism. 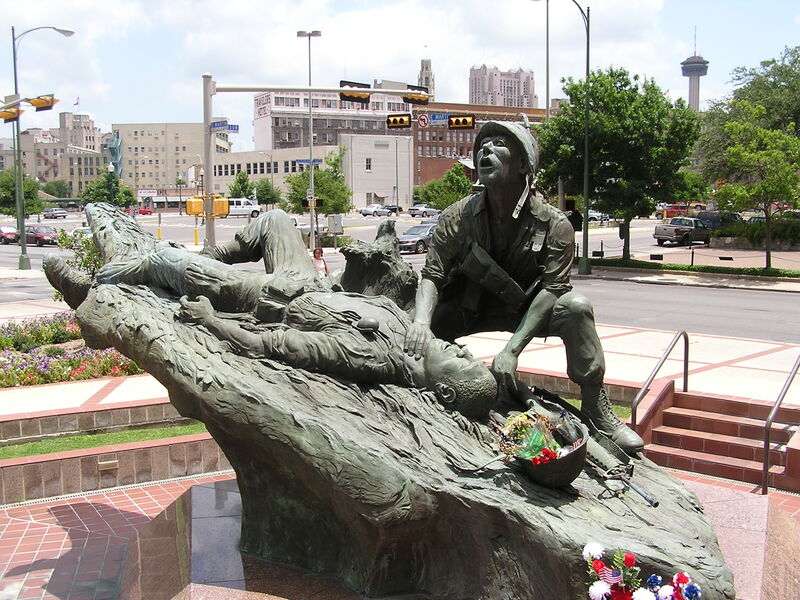 WHOLE DUDE – WHOLE SIN – SAN ANTONIO, TEXAS VIETNAM VETERANS MEMORIAL . 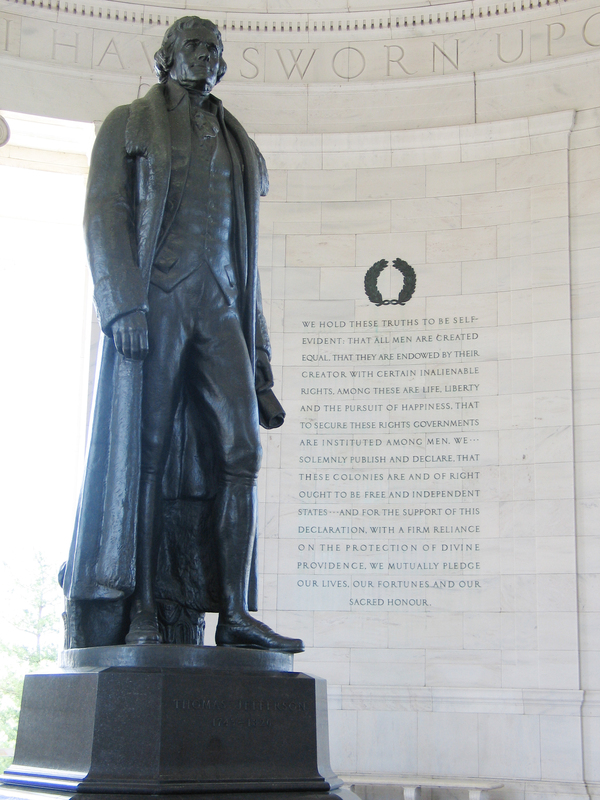 This monument reminds people that the sons and daughters of the United States of America have pledged their Lives, their Fortunes, and their sacred Honor to defend Human Freedom, and Democracy and fought the Enemy called Communism. WHOLE DUDE – WHOLE SIN : The prophesy revealed by Father Moses in The Old Testament, The Fifth Book of Moses, The Book of Deuteronomy, Chapter 28, verses 47 to 50 has come true in the lives of American people. 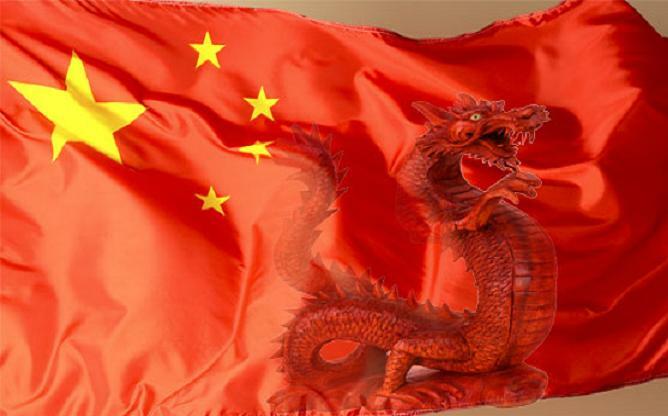 The RED DRAGON, The People’s Republic of China, The Communist nation is the Enemy that Americans will be forced to serve like slaves. WHOLE DUDE – WHOLE SIN : This photo image is the evidence for the “Original Sin.” Chairman Mao Zedong, and Prime Minister Zhou-Enlai are guilty of the crime called “GENOCIDE.” The UN Convention of 1949 defined the crime of Genocide; the systematic destruction by government of a racial, religious, or ethnic group. Dr. Henry Alfred Kissinger of National Security Affairs is guilty of the crime called the misuse and abuse of power. His sinful actions represent the violation of the Supreme Law established by the Constitution of The United States of America. He usurped the powers entitled to the Secretary of State. He conducted secret diplomacy before he was administered the oath to the Office and before he pledged his allegiance to the Constitution. I would like to share some of these photo images that reveal the transgression of Natural Law and its consequences. The people of The United States of America having failed to serve the LORD GOD joyfully and gladly in the time of prosperity, will now serve the Enemy that LORD sent against them. WHOLE DUDE WHOLE SIN : February 21, 1972. 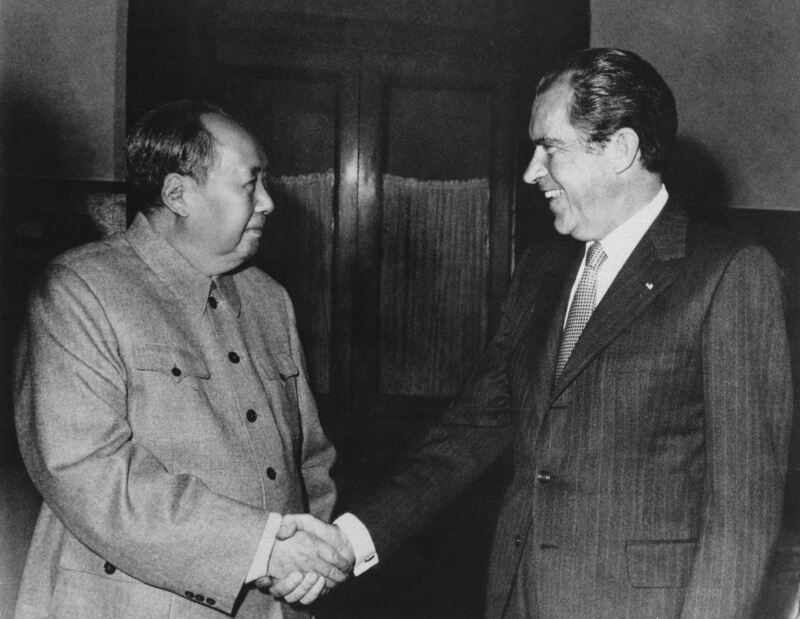 President Richard Nixon with Communist leader Mao-Tse Tung in Peking(Beijing). Chairman Mao represents the Face of Crimes Against Humanity. The UN Convention of 1949 has defined the crime of Genocide as a systematic destruction by a government of a racial, religious, or ethnic group. When this photo was taken, the United States was officially engaged in a battle in Vietnam to contain the direct threat posed by Communism. 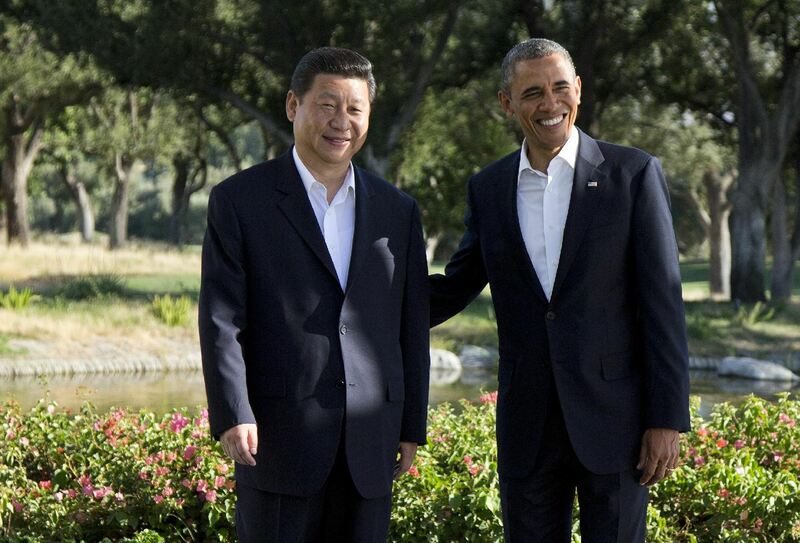 China’s Communist Party leader is the face of that Enemy. 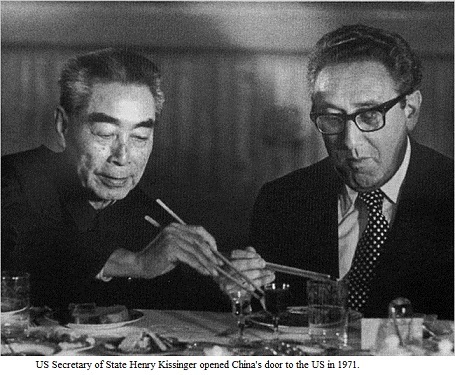 WHOLE DUDE – WHOLE SIN : Communist China’s Premier Zhou En-Lai and the US National Security Adviser Dr. Henry Alfred Kissinger are the faces that represent the Original Sin, they are guilty of the offense called transgression of Law. William P. Rogers was the Secretary of State from 1969 to 1973. Dr. Kissinger had usurped the powers of the Secretary of State and had misused and had abused his office to conduct secret diplomatic negotiations with the Enemy while the United States was openly fighting a grim battle to contain the threat of Communism in Vietnam. WHOLE DUDE – WHOLE SIN : December 01, 1975. 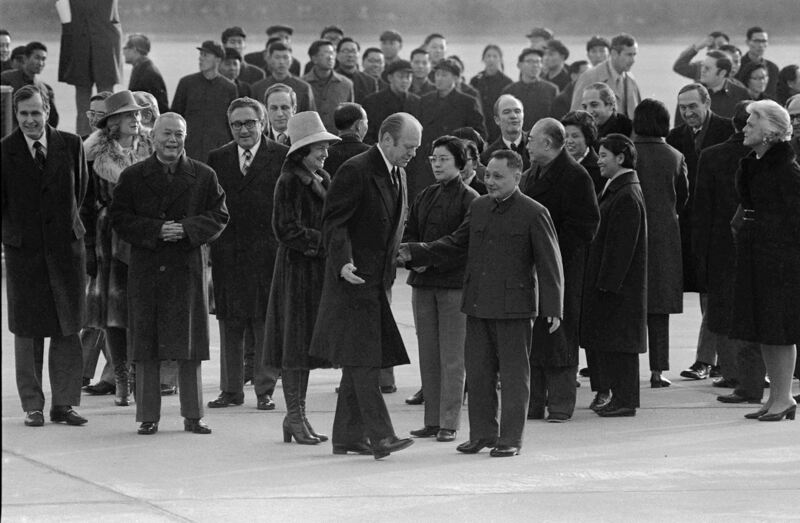 President Gerald Ford with China’s Communist leader Deng Xiaoping in Beijing. George Herbert Walker Bush who later became CIA’s Director on January 30, 1976 is also seen in this photo. Both President Ford and George Bush were fully aware of America’s partnership with India, and Tibet to fight the military threat posed by Communism. Whole Dude-Whole Sin : January 30, 1979. The White House Ceremony. 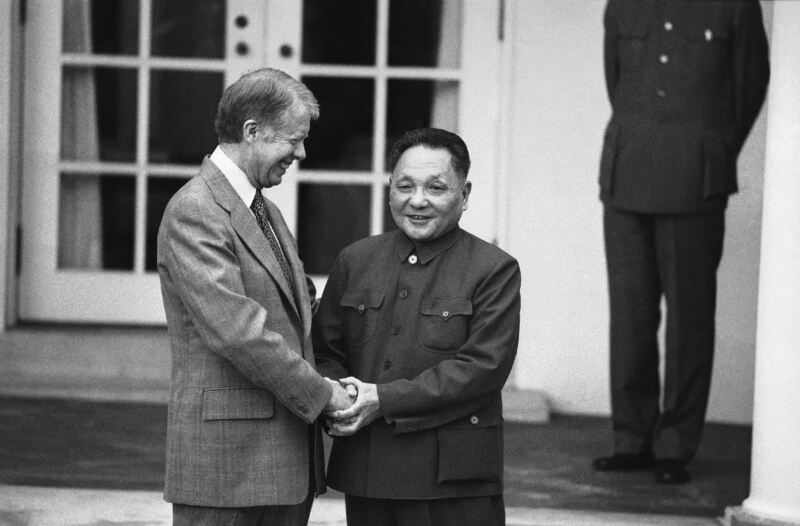 President James Earl Carter(39th president of the US 1977-1981) with Chinese Communist Party leader Teng Hsiao Ping. Does the Declaration of Independence envisage friendly relations with the Communists? Whole Dude – Whole Sin : April 26, 1984. 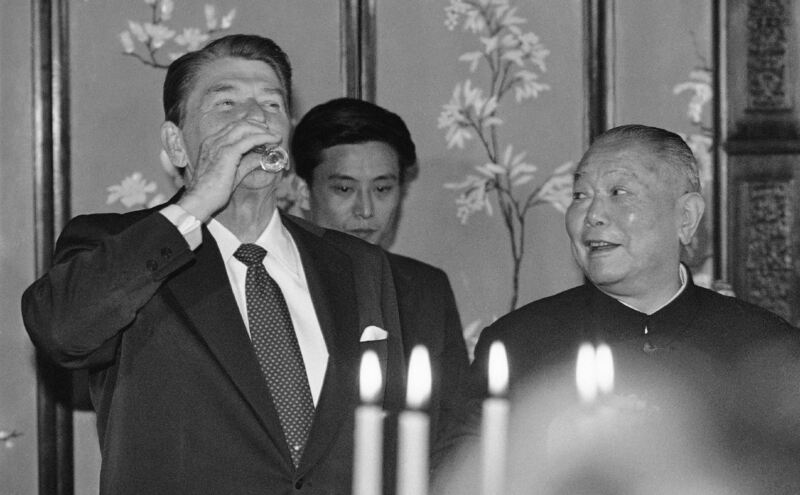 President Ronald Wilson Reagan(40th president of the US 1981-1989) with China’s Communist Party leader and President Li Xiannian. President Reagan, who demanded the tearing down of the ‘Berlin Wall’, could not be a friend of the Communists. Whole Dude-Whole Sin : February 25, 1989. 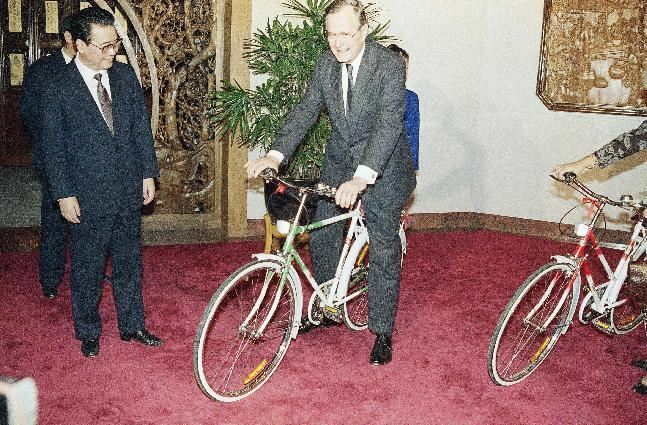 President George Herbert Walker Bush(41st president of the US 1989-1993) riding the bike given by China’s Communist Party leader, Premier Li Pang in Beijing. President Bush who had earlier served as the Director of CIA is fully aware of the US military alliance/pact with India, and Tibet to face the military threat posed by Communist China’s occupation of Tibet since 1950. Whole Dude-Whole Sin : June 27, 1998. 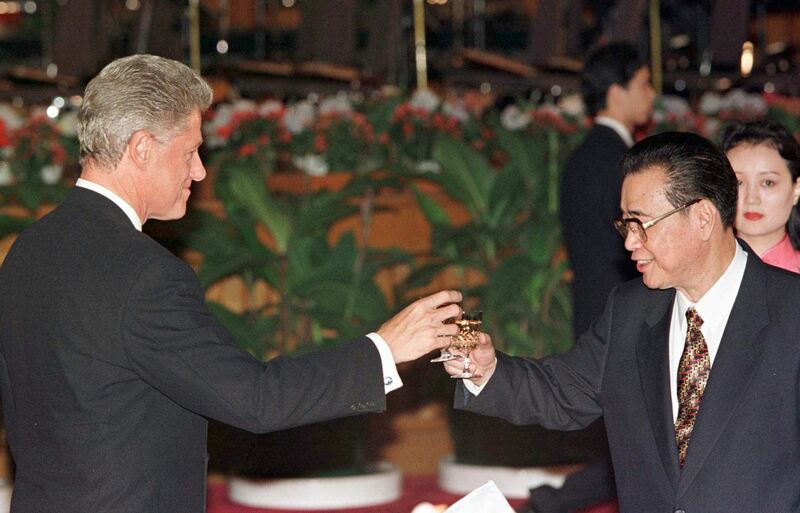 President William Jefferson Clinton(42nd president of the US 1993-2001) with China’s Communist Party leader and Premier Li Peng in Beijing. A willingness to serve the Enemy. Whole Dude-Whole Sin : February 21, 2002. 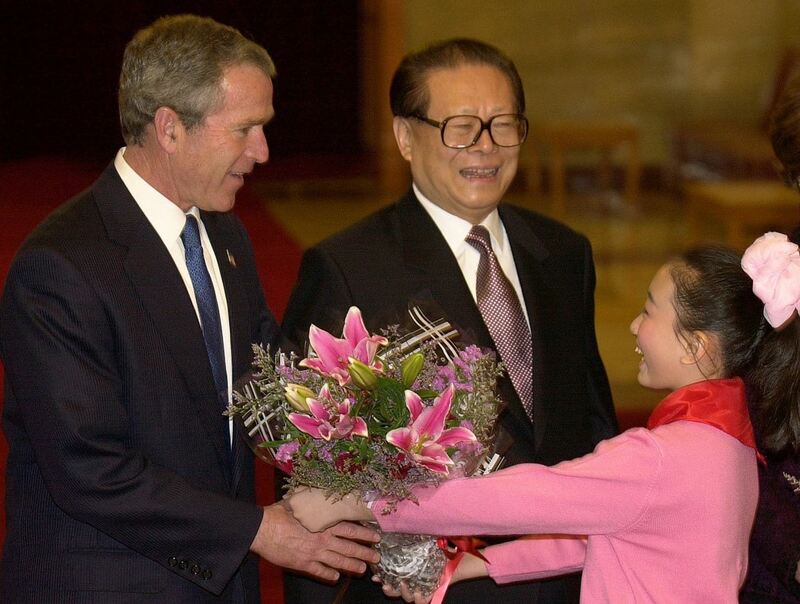 President George W. Bush(43rd president of the US) with China’s Communist Party leader, President Jiang Zemin in Beijing. Communist China’s lack of respect for Human Rights should deter the United States from pursuing this path of self-destruction. Whole Dude-Whole Sin : Friday, June 07, 2013. 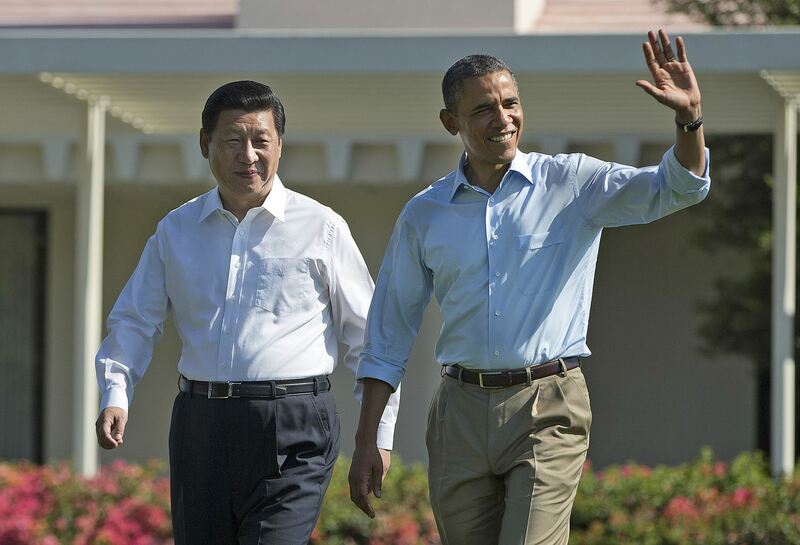 President Barack Obama with China’s Communist Party leader and President Xi Jinping. The prophesy predicted in the Book of Deuteronomy, Chapter 28, verses 47-50 is coming true. The Supreme Law of the United States of America is called The Constitution of The United States of America. The Constitution was preceded by The Declaration of Independence, the written document that pronounced the creation of the nation called The United States of America. I am respectfully claiming that the elected representatives and other officials that constitute the Government have transgressed the Laws of the nation when they began the unholy relationship with Communist China which is opposed to Human Freedom, and the principle of governance by Social Contract called Democracy. Organization : The Spirits of Special Frontier Force.